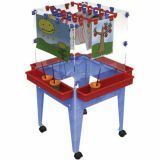 Includes all listed features plus: 3 Open and 2 Small Open Tubs with safety stops 1 repositionable Tiny Tub on front. 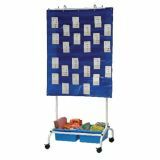 Hang chart paper and pocket charts all from one stand. 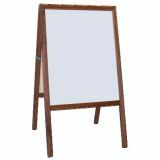 24"W x 33"L double-sided magnetic dry erase surface is height adjustable in 3" increments. 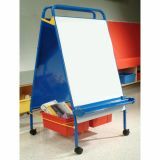 Features locking/adjustable Big Book ledge with “Safety Caps”, two telescoping hooks for pocket charts up to 49" wide, four locking casters, and “snap on” chart hooks. Includes two open tubs with lifetime warranty. Ten-year frame warranty. 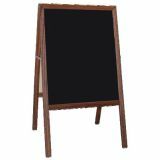 Frame measures 50"-69 1/2"H x 28"W x 27"D. Weight 35 lbs. Additional shipping charges apply. 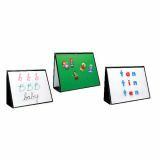 Portable easel offers multiple height options! 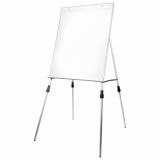 Sleek 1⁄2" aluminum frame surrounds bright white non-ghosting dry erase board. Marker tray spans the entire width and will support posters and large- format books. Locking safety hinges hold frame open or fold for storage. 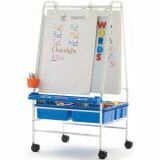 Steel tubing legs feature anti-skid tips and are height adjustable for use on floor or table top. 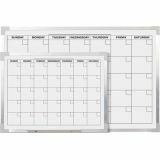 Dry erase surface is 271⁄2"W x 32"H with a pressure -regulated steel strip to hold tablets in place with thumb screws. 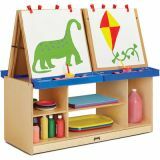 Space-saving hybrid easel combines traditional teaching elements with device storage! 5-year frame, 1-year electrical components, and lifetime Tech Tub2® warranty.